History: (What If? I#12) - When Rick Jones snuck onto the gamma bomb test site, Dr. Bruce Banner came rushing outside to save him before the bomb went off. Rick pushed Bruce into a protective trench just as the bomb went off, showering Rick with gamma rays. 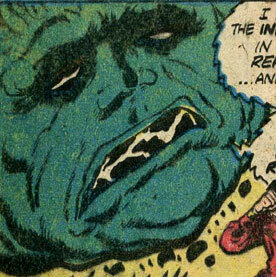 That night, Rick transformed into an immense green-skinned behemoth who busted out of the hospital. Outside the hospital, Rick was confronted by soldiers but leapt away. Bruce followed him and by morning, Rick transformed by into his normal self. The next night, Bruce took Rick to a military undersea chamber that was set up to withstand an atomic blast. When Rick once again transformed into the Hulk (which the military had begun calling him), he could not escape the chamber and night passed without harm. Soon after, the Norse God of Mischief Loki plotted against his half-brother Thor by causing Rick to transform into the Hulk during the day while Bruce was about to test a device that would transform Rick to normal. Bruce attempted to use the device on Rick but the Hulk smashed it when Loki overrid the machine's rays with his magic. The Hulk once again leapt away only to see an illusion of dynamite that Loki placed on some train tracks. Smashing into the tracks while trying to retrieve the explosives, the Hulk was soon confronted not only by Thor, but with Ant-Man, Wasp, and Iron Man as well. The group of heroes soon discovered Loki's plot and decided to band together as the Avengers, with Rick joining as the Hulk. Not long after their creation, the Avengers were rocked by an attack by the Space Phantom whom the Hulk defeated with the help of Giant-Man. Just as the Hulk was about to quit the Avengers due to his not wanting to "jam" with the Avengers, Bruce blasted him with a newly-rebuilt gamma device that turned Rick back to normal. Rick decided to leave the Avengers and start a new life, quickly becoming depressed due to the fact that he could have killed someone as the Hulk and not been able to control it. He soon walked into a battle Captain America and Hydra where he managed to save Cap's life from a Hydra agent. Impressed by Rick's spirit, Captain America offered Rick a place as his new sidekick until Rick once again transformed into the Hulk during another battle with Hydra. The Hulk soon left when Cap begged him to release the Hydra agent that he almost killed. Saddened that he had not told Captain America the truth, Rick soon saw "Captain America" pointing at a set of bracelets and when he donned them, Rick became mentally connected to Kree super-hero Captain Marvel. Marvel instructed Rick to slam the bands together, which shunted Rick into the Negative Zone where he was face-to-face with Annihilus. Feeling like he was transforming again, Rick instead blasted Annihilus with mental energy and was soon called in to end the Kree/Skrull War on behalf of the Intelligence Supreme. Soon after returning to Earth, Rick met Mordecai Boggs and Lou Ann Savannah, whose uncle Benjamin he helped against Megaton. While Rick and Captain Marvel shared adventures, Bruce continued using the laboratories of Tony Stark to construct a device he called the Gammatron. Upon its completion, Bruce was contacted by Lou Ann Savannah who explained Rick's situation with Captain Marvel. Bruce and Lou Ann soon paid a visit to Reed Richards, whose Negative Zone portal they hoped to use to help Rick escape. Rick was once again confronted by Annihilus in the Negative Zone while Captain Marvel passed out due to exposure to the nerve gas Compound 13. Quickly setting up the Gammatron in Reed Richards' lab, Bruce and Lou Ann watched in horror as Rick transformed into the Hulk and took the battle to Annihilus. After three hours had expired, the Hulk switched places with the unconscious Captain Marvel, whose time limit on Earth had run out. As Annihilus prepared to kill Captain Marvel, the Hulk thought himself a sissy and tried to smash off the Nega-Bands, switching places with the Captain once more and punching Annihilus in the face. With the Hulk distracted in battle, Bruce chose that moment to blast the Hulk with the Gammatron which separated the Hulk from Rick. 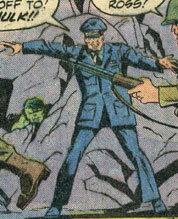 Mister Fantastic quickly intervened to save Rick, leaving the Hulk in the Negative Zone and also freeing Rick from his connection to Captain Marvel upon his removal from the Negative Zone. While Rick and the others rejoiced, the Hulk defeated Annihilus and the Negative Zone inhabitants praised him. Comments: Created by Don Glut, Sal Buscema, and Bill Black. This reality's divergent point occurred during the events seen in Incredible Hulk I#1. I must admit this was one of the funniest What Ifs I had ever read, mainly just to the fact that we see Hulk shouting stuff like "Bah! Square is too chicken to fight!," "Soldiers...uncool! Soldiers don't fight fair! Use shivs...heaters! Well, Hulk won't rumble with soldiers...but will cut out instead!," and "Hulk ain't no sissy--won't wear bracelets! Gonna smash 'em off!" Given the appearance of a Space Phantom in this reality, can Immortus be far off? Annihilus was essentially the same as his Earth-616 counterpart up until he tried to kill Rick Jones in the Negative Zone, causing Rick to transform into the Hulk. Once Rick and the Hulk were separated into two beings, the Hulk dealt Annihilus a swift defeat despite his Cosmic Control Rod. Annihilus had vast cosmic powers due to his possession of the Cosmic Control Rod. Like their Earth-616 counterparts, the Avengers were formed due to an attack on Thor by Loki. Loki had tricked Iron Man, Ant-Man, Wasp, and Thor into battling Rick Jones as the Hulk but they eventually discovered Loki's trick and teamed to defeat him. They then decided to band together and Rick joined them as the Hulk against the Space Phantom soon after. Not wanting to "jam" with the Avengers, the Hulk soon left and it was not until months later that Rick once again aided the Avengers (now with an increased roster including Vision, Quicksilver, the Scarlet Witch, and Captain America) during the Kree/Skrull War. They were: (clockwise from left): Thor, Quicksilver, Scarlet Witch, Captain Marvel (not a member, but an ally), Captain America, Vision, and Iron Man. Not pictured are: Wasp, Giant-Man, and the Hulk (who quit soon after the team's formation). Dr. Bruce Banner was an expert in gamma radiation, like his 616 counterpart. When he tried to save Rick Jones from the gamma bomb, Rick pushed Bruce into a protective trench while Rick was bathed in gamma rays. Later that night, Bruce stayed with Rick to make sure he was ok, only to watch him transform into the Hulk. Determined to free Rick of the curse that he felt responsible for, Bruce first tried to imprison Rick in an undersea chamber at night so that he would not be able to harm anyone but Bruce later created a device designed to drain the gamma radiation from Rick's body and transform him to normal. When the Hulk joined the Avengers, Bruce was given access to Tony Stark's labs in an effort to cure the Hulk and managed to temporarily cure Rick with another gamma device. Months later, Rick once again transformed into the Hulk while he was bonded to the Kree Captain Marvel. Upon hearing the news of Rick's predicament from Rick's girlfriend Lou Ann, Bruce contacted Reed Richards and asked to use Reed's Negative Zone portal to free Rick. When they found Rick in the Negative Zone, he was battling Annihilus. 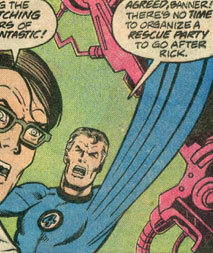 Bruce eventually managed to blast Rick with his new and improved Gammatron, separating Rick and the Hulk into two entities. Mister Fantastic then pulled Rick from the Negative Zone, also freeing him from his bond with Captain Marvel. Bruce, Lou Ann, Captain Marvel, and Rick then celebrated their newfound freedom. Mordecai Boggs met Rick when Rick sought employment at a Greenwich Village cafe where Lou Ann Savannah had just performed. He was not any different than his Earth-616 counterpart. 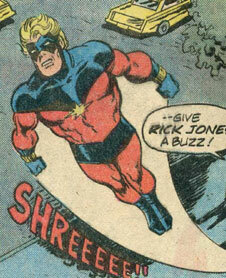 Captain Marvel was the same as his Earth-616 counterpart up until he bonded with Rick Jones, who was also the Hulk. When Captain Marvel helped the Avengers during the Kree/Skrull War, Rick was freed from his bond by the Kree Intelligence Supreme only to find himself bonded to Marvel once again when Marvel bonded with Rick to save his life. During the course of their bonding, Captain Marvel could only escape his Negative Zone prison for 3 hours whenever he and Rick switched places by slamming the Nega-Bands together. When Marvel went unconscious due to exposure to the nerve gas Compound 13, Rick transformed into the Hulk to battle Annihilus in the Negative Zone. While there, Bruce Banner blasted the Hulk with his Gammatron device, splitting the two into two separate entities. Mister Fantastic then freed Rick from the Negative Zone, leaving Captain Marvel free as well due to their connection. Back on Earth, Captain Marvel celebrated his newfound freedom with Rick, Dr. Banner, and Lou Ann before flying off to continue his super-hero career. 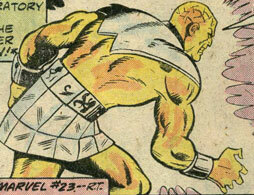 Captain Marvel wore the Kree Nega-Bands which allowed him to manipulate for various effects. 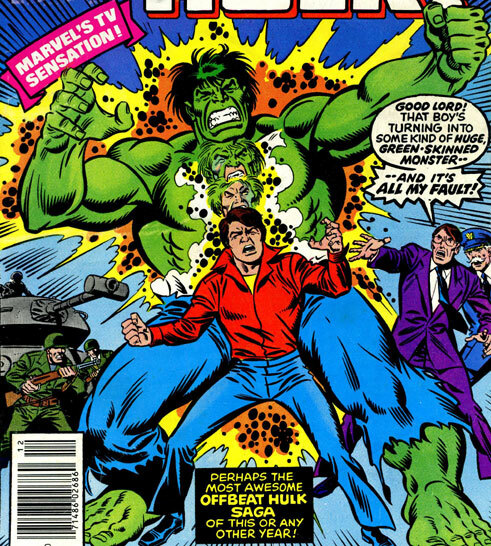 The Hulk was a violent side of Rick Jones' personality that first manifested when Rick was hit by a gamma bomb. At night, Rick would transform into the Hulk and as such, he helped found the Avengers only to quit after a battle with the Space Phantom. Before he left, the Hulk was blasted with a gamma device by Dr. Bruce Banner, temporarily curing Rick on his transformations. The Hulk soon resurfaced after Rick had become Captain America's sidekick and threatened to kill a Hydra agent until Cap begged him to release the agent. When Rick soon found himself bonded to Captain Marvel, the Kree Intelligence Supreme briefly cured Rick of his transformations once again only to have Rick transform back into the Hulk when Annihilus attacked him in the Negative Zone. During his battle with Annihilus, Dr. 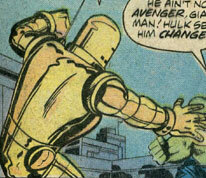 Banner blasted the Hulk with the new and improved Gammatron device that separated the Hulk and Rick into two beings. 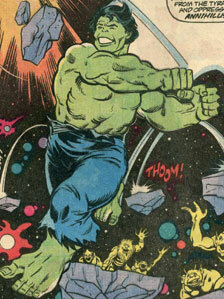 The Hulk was left in the Negative Zone where he defeated Annihilus and became the new ruler of the Negative Zone. The Hulk had superhuman strength and durability. 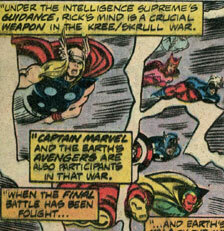 The forces of Hydra were the same as their Earth-616 counterparts. During a battle with Captain America, one faction of Hydra was defeated by Cap with the help of Rick Jones, who soon became Cap's new partner. When the duo confronted another faction of Hydra, Rick transformed into the Hulk and nearly killed an agent before Captain America begged him to release the agent. The Kree Intelligence Supreme was a sentient construct consisting of the greatest Kree minds in history. During the Kree/Skrull War, he freed Rick Jones from his bond with Captain Marvel so that Rick could aid the Avengers in defeating the Skrulls. He then explained to Captain Marvel that he had to bond with Rick once more to save his life. The Intelligence Supreme had the combined intelligence of the greatest minds of the Kree. 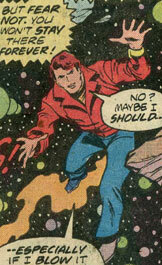 Rick Jones, like his Earth-616 counterpart, was dared to go out on the gamma bomb testing site only to have Dr. Bruce Banner run out in an attempt to save him. Rick pushed Bruce into a protective trench taking the full blast of the gamma bomb himself which later transformed him into the green-skinned Hulk. Soon after, Rick helped found the Avengers as the Hulk but then quit after one mission. As he tried to leave, Dr. Banner blasted him with a gamma ray device causing Rick to temporary transform back to normal. While returned to normal, Rick met Captain America and began training with him as his sidekick until he once again transformed into the Hulk and leapt away. He soon found himself bonded to the Kree Captain Marvel, being shunted into the Negative Zone everytime Marvel was active on Earth. During his time with Captain Marvel, Rick began a singing career and met his soon-to-be girlfriend Lou Ann Savannah. While in the Negative Zone, Rick was attacked by Annihilus while Lou Ann recruited Dr. Banner to help her free Rick from the Zone. As Rick transformed into the Hulk to defeat Annihilus, Bruce blasted Rick with his Gammatron device, separating Rick and the Hulk into two separate entities With the aid of Mister Fantastic, Rick was also freed of his bond with Captain Marvel when he was pulled from the Negative Zone. He then celebrated his newfound freedom. As the Hulk, Rick would transform into a superhumanly strong and durable monster at nightfall. Once separated, Rick had no superhuman powers. 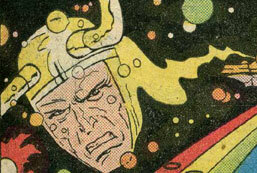 Loki was the same as his Earth-616 counterpart up until he used Rick as a pawn against Thor. Mentally forcing Rick to transform into the Hulk during the day, Loki manipulated the Hulk into becoming a menace by destroying a train track. When Thor, Ant-Man, Wasp, and Iron Man teamed up against the Hulk, they discovered Loki's involvement and teamed up with the Hulk to defeat him. Loki had vast mystical abilities, able to cast illusions and project his astral form. Megaton was the same as his Earth-616 counterpart excepting that the Rick Jones he attacked was also the Hulk. Megaton absorbed power around him, like his 616 counterpart. Reed Richards was the same as his Earth-616 counterpart up until Dr. Bruce Banner and Lou Ann Savannah contacted him to help save Rick Jones using his Negative Zone portal. When they found Rick, he was battling Annihilus as the Hulk and Dr. Banner blasted the Hulk with the Gammatron device, splitting Rick and the Hulk into two beings. Mister Fantastic then intervened, stretching his arm into the Negative Zone to pull Rick to safety. Mister Fantastic could stretch his body, like his 616 counterpart. General Ross was the same as his 616 counterpart up until Rick escaped the military hospital as the Hulk. Ross led a search for the Hulk but the Hulk leapt away. Never finding the Hulk, Ross was eventually confined to a desk job due to lack of action. 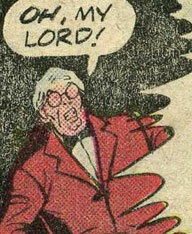 Dr. Savannah was the uncle of Rick Jones' girlfriend, Lou Ann Savannah. When his lab was attacked by Megaton, Rick tried to help and ended up revealing his bond with Captain Marvel in the process. Lou Ann Savannah was a singer who met Rick when he was looking for employment at a Greenwich Village cafe. The two soon began dating and Rick helped Lou Ann's uncle stop the rampaging Megaton, revealing his bond with Captain Marvel in the process. After Rick had a few trips to the Negative Zone, Lou Ann sought to help Rick by contacting Dr. Bruce Banner and explaining Rick's predicament. Banner contacted Reed Richards to use his Negative Zone portal and when they found Rick, he was battling Annihilus as the Hulk. Rick was soon split from the Hulk by Dr. Banner and Reed Richards and brought back to the Earth. With Rick now free of both his curse as the Hulk and his bond with Captain Marvel, he and Lou Ann celebrated. The Space Phantom was an alien who attacked the Avengers early in their career by impersonating the various members and sowing mistrust amongst them. He was defeated by the Hulk and Giant-Man together.